Let’s say your business is running a new promotion. 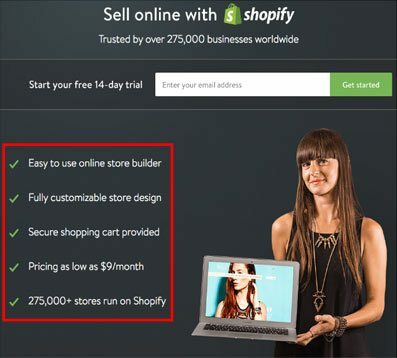 You want consumers to try a new service you’re introducing so you decide to offer it at a low introductory price. You spend a ton of money on advertisements and promote it on social media but only get a couple people to sign up. What happened? This is something most small business owners can relate to. There can be many reasons for promotions like these failing to live up to expectations. One that is consistent across many small business advertising campaign though is poor landing page design. 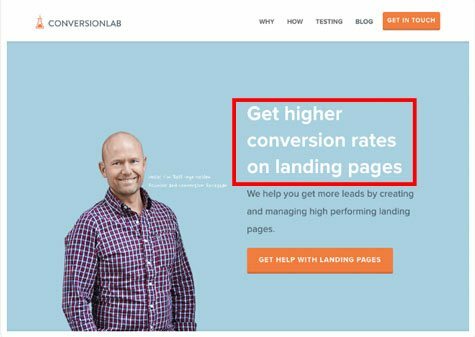 In this article we will discuss what landing pages are, why they are important, and how to design them to convert more website visitors into leads and customers for your business. A landing page is simply a webpage that consumers “land” on after clicking on an ad or other weblink. They are pages that are specifically designed to convert those consumers into leads or customers. While landing pages are most commonly associated with pay-per-click (PPC) advertising campaigns, they can be used to improve the performance of e-mail marketing and social media campaigns as well. Why Design Landing Pages Instead Of Using Existing Webpages? Why should we build a specific landing page for every individual advertising campaign? Can’t we just use an existing product page or our contact page instead? While you could use webpages like these as landing pages for your ads and get some conversions, custom landing pages will always convert better than generic pages like these. Custom landing pages convert better because they are more relevant to the offer and because they remove all unnecessary information. The average attention span of a human is currently quoted as being around 8 seconds. This means that if consumers have to go searching for something most will either lose interest or get distracted. A well designed landing page will focus the consumer’s attention, limit distractions and emphasize the offer. This focus greatly increases the number of conversions that you are able to generate. Your headline is generally the first thing that consumers read. It should be large, easily readable and stand out from the rest of the page. Your headline should be large and focus on the core benefit of your offering. The sole purpose of your headline is to excite the consumer and compel them to continue reading. If you don’t get the consumer’s attention with your headline, you’re going to struggle to get them to continue reading the rest of the page. Remember that consumers have a very short attention span. If you don’t sell consumers in the first 8 seconds that they are on your page, you risk losing them before they even get to the offer. Your headline should describe your offer clearly. Focus on the benefit that the customer will receive and be specific. If your offering will save the consumer money your headline could be something like “Start Saving X Dollars Per Month” or “Stop Wasting X Dollars Every Week”. Headlines like these are much more powerful than a generic “Sign Up For Our Free Seminar On Saving Money” headline. Be as specific as you can. Which sounds more appealing to you; “Start saving money” or “Start saving $100 every week”? The more specific the information, the more powerful it is to potential leads. By adding in “per month” and “every week” to these headlines we are also creating urgency to our offering. Urgency can be added by including a deadline (“offer valid until…”), limiting quantities (“the first 10 people will receive…” or “while supplies last”) or, like the headlines above, by showing consumers what they are missing out on by not taking your offer. These headlines show that not only will you save money by taking the offer, you are currently wasting money. This idea of wasting money creates urgency to take your offer. Next should be a short description that complements the headline and adds more detail about your offer. The emphasis here is again on clarity. If your offer is still unclear to your consumers then your conversion rate will suffer. Keep your description concise (no more than a few sentences) and avoid long paragraphs. Get rid of any words or phrases that aren’t essential to communicating the value of your offering. Use the Hemingway web app to help remove any unnecessary words from your copy. Bullet points or checkboxes are a great way to showcase the benefits of your offering quickly and concisely. Images can be powerful persuaders and should always be included in your landing page design. Choose a high quality image that shows off your offering or its benefits. Avoid stock photos in favour of custom images. A photo that is consistent with the rest of your page reinforces your offering and maintains clarity. Generic stock photos will never fit in as well as an image that is custom designed for a single page. After consumers are sold on your offer you need to tell them how they can claim it. Your landing page should therefore contain at least one compelling call to action (CTA). A call to action is an instruction to your consumer that is meant to compel them to take an action. Basic CTAs include “shop now”, “download now”, “learn more”, “visit a store today” and “call us today”. 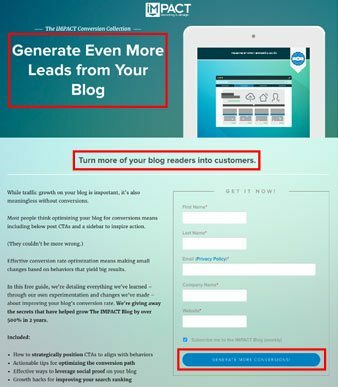 Generic CTAs like those are not what you want in your landing page however. Your CTA should be specific to your offering and reinforce your headline and description. If your headline is something like “Save $100 A Week With X”, your CTA could be “Start Saving $100 A Week” or “Fill Out The Form Below To Start Saving $100 A Week”. Consistent messaging between your headline and CTAs reinforces the value and improves the clarity of your offering. The language you use will depend on where you place your CTA. The submit button of your contact form is a great place for a CTA but you can also add one into the description, headline, or a sub headline. The more CTAs you have the better, as long as make sure they are consistent. You don’t want to confuse consumers by instructing them to do two different things at once. Lastly comes your contact form. Your contact form should be a big focal point in your landing page design. It should be large and stand out against the background. 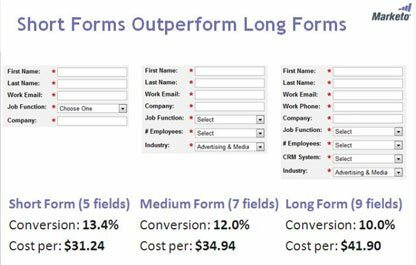 Research from Marketo shows the impact on conversion rate and cost per conversion that changing the number of fields makes. When adding a contact form only add fields for information that you really need. People are wary about giving away their information online. The more information you ask for, the less people will want to give it to you. If you have forms fields that you don’t absolutely need, remove them your form. You can always follow up with the consumer later to get further information. If you require more than 4 or 5 fields to be filled out, consider a two step form. Your main form will ask the consumer to submit a few basic fields like their name and e-mail address. Once these fields are submitted the consumer will be redirected to a second page where they are asked to submit more information before they can receive your offer. Two step forms work for a couple of reasons. First, it splits the form into two more manageable and less daunting forms. Second, once the consumer has submitted some information they have made a commitment. Once that commitment is made it is much easier to get a second one. For more contact form design tips check out this article from Crazy Egg. When looking at the overall design of your page, less is more. A cluttered page can distract the consumer, taking focus away from the core offer and causing them to leave before fully understanding your offering. Use whitespace to separate the individual elements and remove all elements that don’t directly relate to your offer. This includes social media buttons and even the navigation bar of your website. Page elements such as these only give your consumers an opportunity to click away from your page. 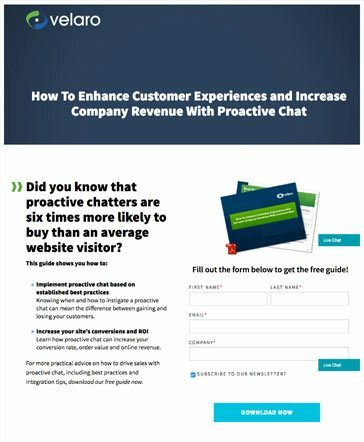 Once they are off of your landing page their chance of returning and converting are essentially zero. A well laid out landing page. Notice how the main elements of the page stand out and are separated by space. The space between them allows the consumer to better focus on these elements. Also notice how there is no navigation bar or other links that could take you away from the page. While often overlooked, the design of your landing pages can be the difference between successful and unsuccessful online advertising, social media, e-mail marketing and inbound marketing campaigns. For best results keep your landing pages simple and focused around one product or offering. For more landing page design tips, check out our infographic on landing page design. 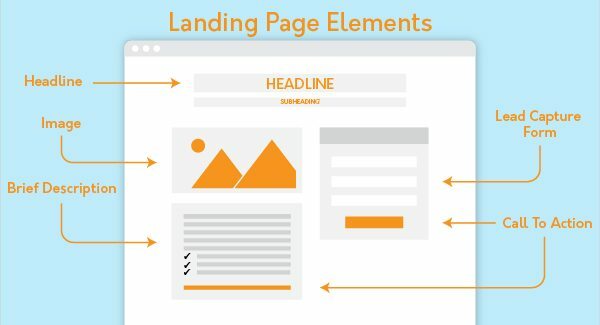 All landing page design examples in this article were taken from this article from Hubspot. Check it out for some more landing page design inspiration!